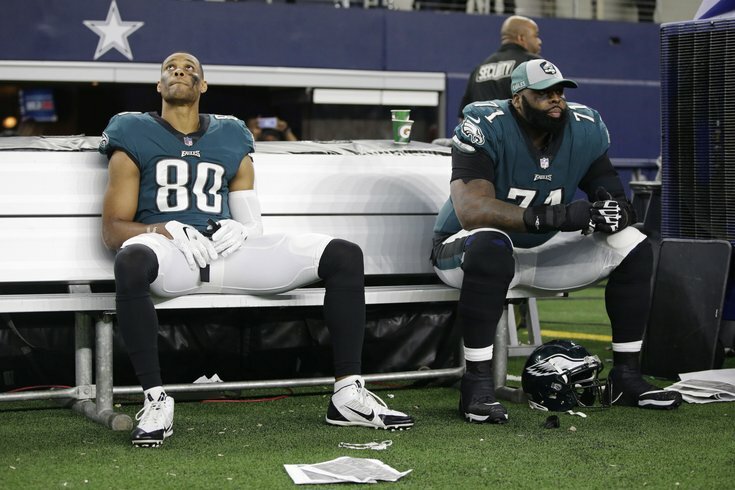 After a 29-23 loss to the Dallas Cowboys in overtime in their most important game of the season, the Philadelphia Eagles are not going to repeat as NFC East champions, and their chances of making the playoffs are now somewhere between slim and none. Their loss was not without major controversy. The Eagles have started slowly all season long, and Sunday was no different, as they were shut out in the first half. In the first two quarters, the Eagles had 70 yards, four first downs, a turnover, and they possessed the ball for a measly eight minutes and 46 seconds. Earlier in the week, Kamu Grugier-Hill called the Cowboys chokers, and while he wasn't wrong, it was the Eagles' offense that choked with the playoffs on the line. Remember when Doug Pederson was this swashbuckling, risk-taking, "IDGAF" head coach who defied norms and trusted analytics in his big-moment decision making? He doesn't live here anymore. After the Eagles closed to within one point on a Darren Sproles touchdown, bringing the score to 23-22, the Eagles connected on the extra point. Tie game. Except wait a minute! Personal foul, Cowboys! In past games, in this very situation, Pederson has typically accepted the penalty, taken the point off the board, and gone for two, as the odds of converting on the two-point conversion improve when going for it on the 1, as opposed to the 2. With 1:39 left in regulation in a huge, pressure moment, Pederson instead kept the point, and elected to enforce the penalty on the kickoff. As it turned out, the Eagles got a stop on the Cowboys' final drive in regulation, and the game went to overtime. In 2017, Pederson was asked after a game about taking a point off the board to go for two from the 1-yard line after a penalty on the PAT. Here's what he said. Q. Can you walk us through the decision to go for the two-point conversion? Is there -- how much did the time in the game, does the third quarter factor into it? How much was the score factor into it? DOUG PEDERSON: Yeah, it really wasn't -- the percentages in that situation are favorable to the offense. It's like a 60/40 success rate. That's the first thing. That, to me, is almost a no-brainer to go for it. The time where we were in the game -- if it was the first quarter, I probably would have done the same thing. [If it was the] Fourth quarter, I probably would have done the same thing, and just felt comfortable with the way our offense had been running the ball at the time. Now it's at the 1-yard line and not the 2 because of the penalty. So great execution. It was just a great run. Nice little cutback run, and got it in. And plus the extra point, you never know later in the game if that point's going to be a factor. So it worked out in our favor. I wonder what the title of Pederson's book will be this upcoming offseason. • The Cowboys fumbled the ball on the opening kickoff. It was an extremely obvious fumble that was somehow missed on the field. • Grugier-Hill clearly recovered the fumble, stood up, and handed the ball to the officials. The officials on the field obviously saw this, and it was captured on camera. • No worries. The Eagles obviously challenged the call. Easy overturn. Except, what? The officials ruled that a clear recovery was not made by either team. • The Cowboys retained possession of the ball, and the Eagles lost both a time out and a challenge. That explanation above is 100 percent nonsense. Grugier-Hill most certainly had "clear possession." There's no way to say that he didn't. I suspect that the NFL is going to defend this call later this week, because, well, that's what they do. And if they do, they will be lying to a large group of their best customers. Is there anyone out there who would still rather have eight games of Golden Tate then a third-round pick? Three targets, seven yards on Sunday. I don't normally like to micromanage play calling unless it's egregiously bad, but there's no good explanation for calling a run for your fourth running back (Wendell Smallwood) on 2nd and Goal from the 11 in the fourth quarter of a do-or-die game, when said running back has just three carries for 0 yards in the previous four games. Heading into this game, the Eagles were without six starters on defense. They were DE Derek Barnett, CBs Jalen Mills and Ronald Darby, S Rodney McLeod, LB Jordan Hicks, and DT Timmy Jernigan. The Eagles had more backups in their starting lineup than starters. They were also missing DB Avonte Maddox, and it became clear during the game that CB Sidney Jones couldn't run due to a bum hamstring. The Cowboys clearly knew it, so they started (successfully) targeting Jones on nearly every play. In total, the defense gave up 576 yards, and yet, somehow kept in the Eagles in it with timely plays. To be clear, we're not handing out any gold stars here to the defense, but it certainly is worth pointing out the mass number of bodies they were missing. 22 of 32 for 228, three TDs, and 0 INTs 120.3 QB rating sounds awesome on paper, but it didn't match the eye test. Wentz had a great fourth quarter, but it was too little, too late, as he failed to make plays in the first three quarters. The Cowboys held the ball for 45:33. The Eagles had it for 22:32. Dallas had double the number of first downs as the Eagles (32-16), and they outgained the Birds by over 300 yards. So, while the officiating was an absolute disaster and they deserve every last bit of criticism they get, ultimately, the Eagles can only blame themselves for this loss, and for the season as a whole. With the Panthers losing today to the Browns, the Eagles' chances of getting into the playoffs as a wildcard stayed alive to some degree on Sunday. FiveThirtyEight.com, for example, still gives the Eagles a 13 percent chance of getting in. If the Vikings lose on Monday night, those odds will be bolstered even further. Does anyone care? No? OK, I tried.